Do you wonder what this mindfulness stuff is all about? It doesn’t have to be a mystery any longer! 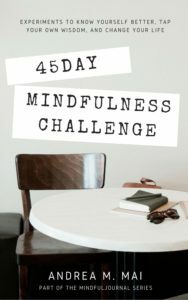 Take a guided journey and explore practical and fun ways to increase mindfulness every day. Mindfulness helps you FIND THE CALM YOU CRAVE and GETS YOU IN TOUCH WITH YOUR LIFE in a meaningful way. It gives you the tools to reduce stress, live joyfully, and find personal freedom. Inside this book are 45 days of challenges with a dose of inspiration and simple experiments to guide you toward a happier life. A link to the Companion Journal download with Contemplation, Timed-Writing, and Journaling instructions. A link to guided meditation instruction download. Experience life in a new and more present way. Spend the next 45 days experimenting with playful insights into your world.